America Revealed: Why Do So Many People Believe in Political Conspiracy Theories? 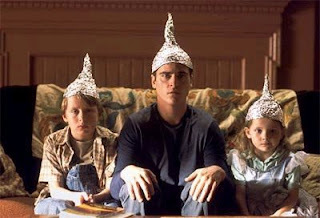 Why Do So Many People Believe in Political Conspiracy Theories? Belief in political conspiracy theories is widespread on both sides of the political spectrum. Some 45% of Republicans believe that Obama is not a native-born citizen and (presumably) that the Democrats have gotten away with covering up that fact. Similarly, 35% of Democrats believe that George W. Bush knew about the 9/11 attack in advance, but let it happen anyway. About a quarter of all Americans, including 32% of Democrats and 18% of Republicans, believe that “the Jews” are to blame for the financial crisis of 2008. People are extremely social critters, and part of what makes that possible is the ability to perceive others as deliberately acting in the world, in other words to detect agency. It’s extremely useful in building respectful communities. Sometimes that faculty doesn’t turn off when it should, and you associate “agency” with events and ideas that are unrelated. When a responsible agent is not easily discernible, that sense that something is still deliberate endures, and you are left wondering, “Well, who caused it, then?” You fill in the blanks. Conspiracy theories are a contemporary mythology, not unlike the Greek gods. Everything that happens has a reason, and the gods affect the course of human events through direct intervention. The ill-defined “they,” whether referring to the U.N., CIA, international bankers, Jews or interdimensional shapeshifting reptilian space aliens living in the hollowed-out artificial moon (yeah, it’s a real one), really seem to me to be a secular version of religious mythology. On the other side, when you are already convinced that agents are working to manipulate world events, people tend to seek out information that reinforces what they already believe. It’s a tendency called confirmation bias, and it is a sort of perceptual filter for what you accept as evidence. I have no doubt that these psychological tendencies play an important role in causing people to endorse political conspiracy theories. But they do not explain why people are so much more likely to endorse poorly supported conspiracy theories about politics than about events in their personal or professional lives. Here too, a ” a responsible agent” is not always “easily discernible.” It would surely be emotionally satisfying for many people if they could blame setbacks at work on a conspiracy by the Trilateral Commission or “reptilian space aliens.” It’s much less painful to believe that than to believe that the failure is largely our own fault. And once such a self-justifying thought occurs to us, “confirmation bias” would reinforce it. The same goes for failures in our personal lives. Yet very few people actually blame personal and professional failures on shadowy conspiracies. Why not? Because deluding ourselves about such matters carries a heavy cost. If you believe that your failures at work are the fault of the Trilateral Commission, you might end up getting fired, or at least passed over for promotion. If you think that “the Jews” are the reason why you can’t get a date, you are probably dooming yourself to more lonely weekends. In each of these areas, our individual beliefs and actions make a real difference to the outcome. So people have strong incentives to seek out the truth rather than accept emotionally satisfying falsehoods. Obviously, some people still fall prey to ridiculous conspiracy theories in these fields, and few are willing to face the whole truth about all their flaws. But most people at least make a reasonable effort to assess their jobs and personal life rationally. With politics, by contrast, the chance that any one individual vote will make a difference is miniscule. If you are deluded about Obama’s citizenship status or the causes of the financial crisis, it will not have any impact on policy. Nor will it harm you personally. As a result, people tend to be “rationally ignorant” about politics, and to do a poor job of evaluating the information they do learn. They don’t consciously embrace beliefs they know to be false. But they also don’t make much of an effort to critically evaluate the ideas they come across. If a conspiracy theory is emotionally satisfying and reinforces their preexisting prejudices, they are more than happy to run with it. This is perfectly rational and understandable behavior for individual voters. Unfortunately, it can lead to unfortunate collective outcomes in so far as such beliefs influence election results and the content of public policy. UPDATE: I previously wrote about the relationship between rational ignorance and belief in political conspiracy theories here. This claim depends on Ilya’s assertion that “very few people actually blame personal and professional failures on shadowy conspiracies.” I think Ilya is just wrong here. People do attribute personal and professional failures to conspiracies – constantly. Those shadowy conspiracies are simply less grand (and thus less likely to be generally known). My boss is out to get me at work; my friends deliberately set me up to look bad; etc. Moreover, I think Ilya’s claim of rational conspiracy theories makes the process seem more inevitable than it might otherwise be, and doesn’t explain which theories get traction (Grassy Knoll, Long-Form Birth Certificate) and which don’t (Moon Landing). Of course people sometimes believe that they are the victims of small-scale conspiracies in their personal lives. But such beliefs are rarely as absurd and ridiculous as many widely believed political conspiracy theories. Mistakenly believing that the boss has it in for you is not in the same league with believing that Bush knew about 9/11 in advance or that Obama successfully covered up the fact he’s not really constitutionally eligible to be president. That’s because people have strong incentives to develop at least a reasonably accurate understanding of their bosses and friends. Not so with politics. It was not the purpose of my post to explain “which theories get traction,” and “which don’t.” But my analysis does imply at least a partial answer to this question: theories will get traction if they conform to a significant number of people’s preconceptions and if they are simple and emotionally appealing. Ilya’s collective-action-delusion theory also absolves public figures (e.g., well-known libertarian bloggers) from any responsibility to use their moral authority to persuade the public that conspiracy theories are bunk. There is tons of evidence that people tend to listen carefully to thought-leaders who represent and embody their values, especially when those representatives are speaking about complex topics that the listener has no easy way to investigate herself. Nothing in my analysis diminishes anyone’s moral responsibility. As I have often explained in the past, the fact that political ignorance and irrationality are the result of a collective action problem does not mean that they represent morally defensible behavior on the part of either the ignorant voters themselves or the political leaders who exploit that ignorance. At the same time, there is no lack of easily available evidence to refute the various conspiracy theories out there, much of it from well-known public figures and publications with “moral authority.” A quick internet search is more than enough to find evidence proving that birtherism or 9/11 conspiracy theories are bunk. The problem is that, as tons of evidence shows, most people are usually unwilling to look for evidence that cuts against their preexisting political views, and tend to reject it when it’s presented to them. And that is especially true of people whose commitment to their views is strong enough that they are ready to endorse even dubious conspiracy theories, so long as they coincide with their preconceptions. Finally, it’s worth noting that political leaders and activists face a collective action problem of their own here. If they refuse to exploit conspiracy theories that favor their own side, they risk defeat at the hands of less scrupulous opponents. For that reason, it’s not surprising that most successful politicians and activists routinely exploit political ignorance and irrationality whenever it’s in their interest to do so.